When the ground gets wet and squishy they show up. 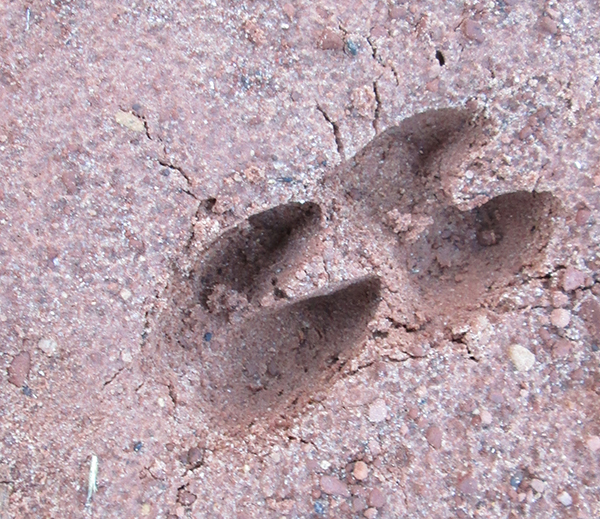 I’ve been trying to figure out what those hoof looking prints are. I’ve never seen anyone on my trails that matches up to those. My person says that’s because they usually come out at night. She says she’s seen them during the day, but never on my trails. I guess those trail creatures are night creatures for sure. My person says they’re usually up to no good. They eat the prickly pear cactus. And they dig up people’s gardens. Sometimes on trash day they knock over all the garbage cans and go through the garbage looking for goodies. I don’t know why they go through my garbage. I already ate all the good stuff. But today I was heading out on my trails – and there it was. Standing right next to my trail looking at us. I tried to give it what for, but my person wouldn’t let go of my leash. I guess she was scared of it. I did manage one thing though. You know how my person is always taking pictures of everything she sees? I chased that creature right back into the bushes before she could get her camera out and aim it. Because I didn’t want that creature taking over my blog. An old one from before I was around? 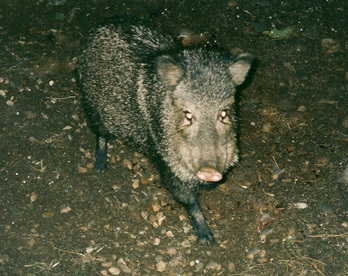 This is a javelina that visited my yard once, a long time ago. Looks like an alien to me! Woooowooooooo! Ku, if that’s an alien that would explain all the strange happenings on my trails lately. I would stay far away from that guy Bongo! Diane, that’s what my person said. She says they can get mean sometimes. Marina, I guess I got carried away. I’ll make sure to stand by my person next time. I wouldn’t want that guy attacking her. Javelina??! I knew it. It is National Pig Day, so….. It was National Pig Day and I missed it? Oh no. Strange looking creature! I would stay away from anything that eats a cactus. Patricia, I think I need to get that creature to stay away from my trails. The cactus around here are full of bite marks. OMD! That javelina looks scary…..is he/she aggressive? Does he/she attack humans and dogs, too? 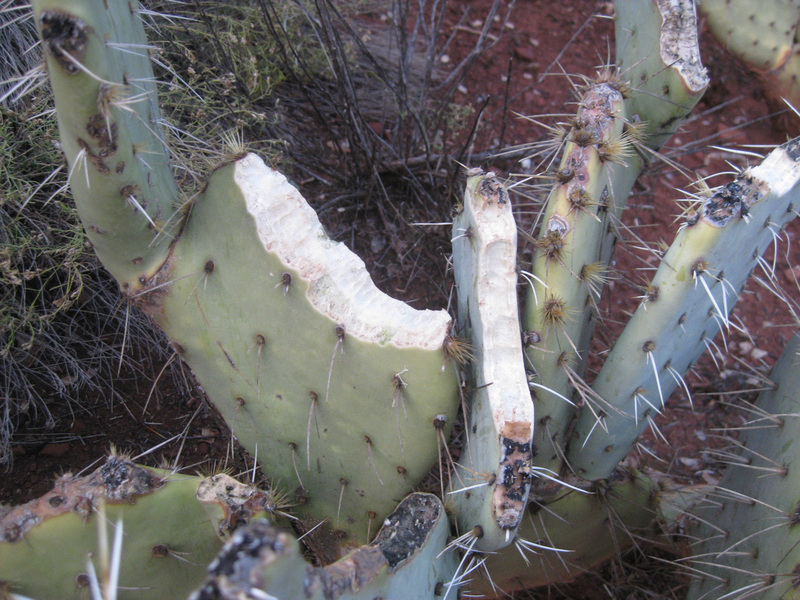 Poor cactus….but….I’m wondering if he/she gets hurt when eating cactus? 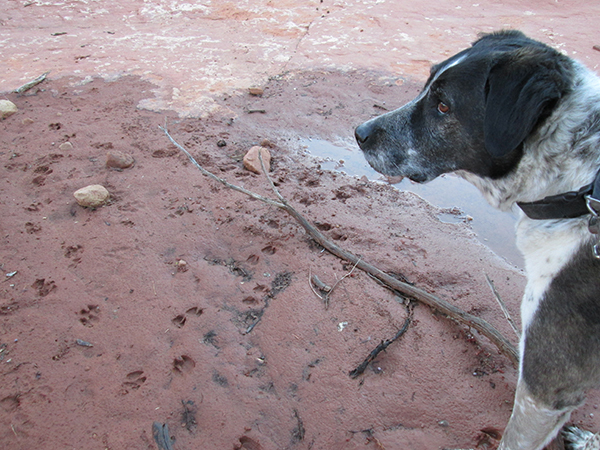 Kevin, my person says she’s heard that javelinas can be mean but she’s only seen them standing around eating stuff. She saw a video of them eating cactus once and they ate it pricklers and all as if it was just a tasty treat. Looks like a warthog lol, nasty creatures. You stay well away Bongo! Susan, since we don’t have warthogs here this must be our version of it. Have never heard of a Javelina, I learn something every day! Petzoup, hardly anyone has heard of a javelina – unless they happen to live in the same place as the javelinas. Ginger, maybe you’d better show up with your flamethrower. These javelinas are always up to mischief.